For broader coverage of this topic, see Display contrast. Contrast is the difference in luminance or colour that makes an object (or its representation in an image or display) distinguishable. In visual perception of the real world, contrast is determined by the difference in the color and brightness of the object and other objects within the same field of view. The human visual system is more sensitive to contrast than absolute luminance; we can perceive the world similarly regardless of the huge changes in illumination over the day or from place to place. The maximum contrast of an image is the contrast ratio or dynamic range. The high-frequency cut-off represents the optical limitations of the visual system's ability to resolve detail and is typically about 60 cycles per degree. The high-frequency cut-off is related to the packing density of the retinal photoreceptor cells: a finer matrix can resolve finer gratings. The low frequency drop-off is due to lateral inhibition within the retinal ganglion cells. A typical retinal ganglion cell presents a centre region with either excitation or inhibition and a surround region with the opposite sign. By using coarse gratings, the bright bands fall on the inhibitory as well as the excitatory region of the ganglion cell resulting in lateral inhibition and account for the low-frequency drop-off of the human contrast sensitivity function. One experimental phenomenon is the inhibition of blue in the periphery if blue light is displayed against white, leading to a yellow surrounding. The yellow is derived from the inhibition of blue on the surroundings by the center. Since white minus blue is red and green, this mixes to become yellow. For example, in the case of graphical computer displays, contrast depends on the properties of the picture source or file and the properties of the computer display, including its variable settings. For some screens the angle between the screen surface and the observer's line of sight is also important. A photograph of a leaf with several colors—the bottom image has an 11% saturation boost and around 10% increase in contrast. There are many possible definitions of contrast. Some include color; others do not. Travnikova laments, "Such a multiplicity of notions of contrast is extremely inconvenient. It complicates the solution of many applied problems and makes it difficult to compare the results published by different authors." The rationale behind this is that a small difference is negligible if the average luminance is high, while the same small difference matters if the average luminance is low (see Weber–Fechner law). Below, some common definitions are given. representing the luminance of the features and the background, respectively. The measure is also referred to as Weber fraction, since it is the term that is constant in Weber's Law. Weber contrast is commonly used in cases where small features are present on a large uniform background, i.e., where the average luminance is approximately equal to the background luminance. representing the highest and lowest luminance. The denominator represents twice the average of the maximum and minimum luminances. This form of contrast is an effective way to quantify contrast for periodic functions f(x) and is also known as the modulation mf of a periodic signal f. Modulation quantifies the relative amount by which the amplitude (or difference) (fmax − fmin)/2 of f stands out from the average value (or background) (fmax + fmin)/2. In general, mf refers to the contrast of the periodic signal f relative to its average value. If mf = 0, then f has no contrast. If two periodic functions f and g have the same average value, then f has more contrast than g if mf > mg. Contrast sensitivity is a measure of the ability to discern between luminances of different levels in a static image. Contrast sensitivity varies between individuals, reaching a maximum at approximately 20 years of age, and at angular frequencies of about 2–5 cycles per degree. In addition it can decline with age and also due to other factors such as cataracts and diabetic retinopathy. In this image, the contrast amplitude depends only on the vertical coordinate, while the spatial frequency depends on the horizontal coordinate. Observe that for medium frequency you need less contrast than for high or low frequency to detect the sinusoidal fluctuation. Visual acuity is a parameter that is frequently used to assess overall vision. However, diminished contrast sensitivity may cause decreased visual function in spite of normal visual acuity. For example, some individuals with glaucoma may achieve 20/20 vision on acuity exams, yet struggle with activities of daily living, such as driving at night. 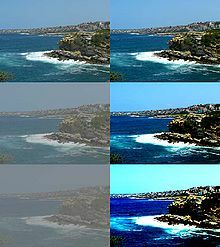 As mentioned above, contrast sensitivity describes the ability of the visual system to distinguish bright and dim components of a static image. Visual acuity can be defined as the angle with which one can resolve two points as being separate, given that the image is shown with 100% contrast and is projected onto the fovea of the retina. Thus, when an optometrist or ophthalmologist assesses a patient’s visual acuity using a Snellen chart or some other acuity chart, the target image is displayed at high contrast, e.g., black letters of decreasing size on a white background. A subsequent contrast sensitivity exam may demonstrate difficulty with decreased contrast (using, e.g., the Pelli-Robson chart, which consists of uniform-sized but increasingly pale grey letters on a white background). To assess a patient’s contrast sensitivity, one of several diagnostic exams may be used. Most charts in an ophthalmologist’s or optometrist's office will show images of varying contrast and angular frequency. Parallel bars of varying width and contrast, known as sine-wave gratings, are sequentially viewed by the patient. The width of the bars and their distance apart represent angular frequency, measured in cycles per degree (cpd or cyc/deg). Studies have demonstrated that medium-level angular frequency, approximately 5–7 cycles per degree, is optimally detected by most individuals, compared with low- or high-level angular frequencies. The contrast threshold can be defined as the minimum contrast that can be resolved by the patient. The contrast sensitivity is equal to 1/contrast-threshold. Using the results of a contrast sensitivity exam, a contrast sensitivity curve can be plotted, with angular frequency on the horizontal, and contrast threshold on the vertical axis. Also known as contrast sensitivity function (CSF), the plot demonstrates the normal range of contrast sensitivity, and will indicate diminished contrast sensitivity in patients who fall below the normal curve. Some graphs contain “contrast sensitivity acuity equivalents”, with lower acuity values falling in the area under the curve. In patients with normal visual acuity and concomitant reduced contrast sensitivity, the area under the curve serves as a graphical representation of the visual deficit. It can be because of this impairment in contrast sensitivity that patients have difficulty driving at night, climbing stairs and other activities of daily living in which contrast is reduced. The graph demonstrates the relationship between contrast sensitivity and angular frequency. The target-like images are representative of center-surround organization of neurons, with peripheral inhibition at low, intermediate and high angular frequencies. Used with permission from Brian Wandell, PhD. Recent studies have demonstrated that intermediate-frequency sinusoidal patterns are optimally-detected by the retina due to the center-surround arrangement of neuronal receptive fields. In an intermediate angular frequency, the peak (brighter bars) of the pattern is detected by the center of the receptive field, while the troughs (darker bars) are detected by the inhibitory periphery of the receptive field. For this reason, low- and high-angular frequencies elicit excitatory and inhibitory impulses by overlapping frequency peaks and troughs in the center and periphery of the neuronal receptive field. Other environmental, physiologic and anatomical factors influence the neuronal transmission of sinusoidal patterns, including adaptation. Decreased contrast sensitivity arises from multiple etiologies, including retinal disorders such as Age-Related Macular Degeneration (ARMD), amblyopia, lens abnormalities, such as cataract, and by higher-order neural dysfunction, including stroke and Alzheimer's disease. In light of the multitude of etiologies leading to decreased contrast sensitivity, contrast sensitivity tests are useful in the characterization and monitoring of dysfunction, and less helpful in detection of disease. ^ Campbell, F. W. & Robson, J. G. (1968). "Application of Fourier analysis to the visibility of gratings". Journal of Physiology. 197 (3): 551–566. doi:10.1113/jphysiol.1968.sp008574. PMC 1351748. PMID 5666169. ^ Klein, S. A., Carney, T., Barghout-Stein, L., & Tyler, C. W. (1997, June). Seven models of masking. In Electronic Imaging'97 (pp. 13-24). International Society for Optics and Aerodynamics. ^ Barghout-Stein, Lauren. On differences between peripheral and foveal pattern masking. Diss. University of California, Berkeley, 1999. ^ Solomon, J. A., & Pelli, D. G. (1994). The visual filter mediating letter identification. Nature, 369(6479), 395-397. ^ Travnikova, N. P. (1985). Efficiency of Visual Search. p.4. Mashinostroyeniye. ^ Michelson, A. (1927). Studies in Optics. U. of Chicago Press. ^ Ph.D., Lawrence Arend. "Luminance Contrast". colorusage.arc.nasa.gov. Retrieved 5 April 2018. ^ Prince, Jerry L., Links, Jonathan M. Medical Imaging Signals and Systems, (2006). pg 65 Ch 3 Image Quality, 3.2 Contrast, 3.2.1 Modulation. ^ E. Peli (Oct 1990). "Contrast in Complex Images" (PDF). Journal of the Optical Society of America A. 7 (10): 2032–2040. doi:10.1364/JOSAA.7.002032. ^ Peter Wenderoth. "The Contrast Sensitivity Function". ^ Hashemi H, Khabazkhoob M, Jafarzadehpur E, Emamian MH, Shariati M, Fotouhi A. “Contrast sensitivity evaluation in a population-based study in Shahroud, Iran.” Ophthalmology. 2012 Mar;119(3):541-6. ^ Sadun, A. A. Optics lecture on 03/06/2013. University of Southern California. ^ Leguire LE, Algaze A, Kashou NH, Lewis J, Rogers GL, Roberts C. “Relationship among fMRI, contrast sensitivity and visual acuity”. Brain Res. 2011 Jan 7;1367:162-9. ^ Sia DI, Martin S, Wittert G, Casson RJ. “Age-related change in contrast sensitivity among Australian male adults: Florey Adult Male Ageing Study”. Acta Ophthalmol. 2012 Mar 16. ^ Wandell, B.A. Foundations of Vision. Chapter 5: The Retinal Representation. 1995. Sinauer Associates, Inc. Accessed at https://www.stanford.edu/group/vista/cgi-bin/FOV/chapter-5-the-retinal-representation/#centersurround on 03/23/2013. ^ Tsui JM, Pack CC. “Contrast sensitivity of MT receptive field centers and surrounds.” J Neurophysiol. 2011 Oct;106(4):1888-900. ^ Jarvis JR, Wathes CM. “Mechanistic modeling of vertebrate spatial contrast sensitivity and acuity at low luminance.” Vis Neurosci. 2012 May;29(3):169-81. ^ Cravo AM, Rohenkohl G, Wyart V, Nobre AC. “Temporal expectation enhances contrast sensitivity by phase entrainment of low-frequency oscillations in visual cortex.” J Neurosci. 2013 Feb 27;33(9):4002-10. ^ Risacher SL, Wudunn D, Pepin SM, MaGee TR, McDonald BC, Flashman LA, Wishart HA, Pixley HS, Rabin LA, Paré N, Englert JJ, Schwartz E, Curtain JR, West JD, O'Neill DP, Santulli RB, Newman RW, Saykin AJ. “Visual contrast sensitivity in Alzheimer's disease, mild cognitive impairment, and older adults with cognitive complaints.” Neurobiol Aging. 2013 Apr;34(4):1133-44.